In seven seasons on Geelong’s list, Lincoln McCarthy managed 29 senior games. Nineteen of those 29 games at the Cattery came in 2016, after being drafted out of Glenelg back in 2011. Aside from that year, injury and selection reasons meant that he simply could not get on the park. As such, he projects very lowly in terms of future output. That being said, McCarthy has shown some solid flashes in his years at the Cats, and some feel that his luck is bound to turn for the better sooner or later. We can’t speak to the validity of the rumour that Brisbane wanted McCarthy because he and their big target Lachie Neale are friends, but it’s an entertaining anecdote and worth mentioning here. 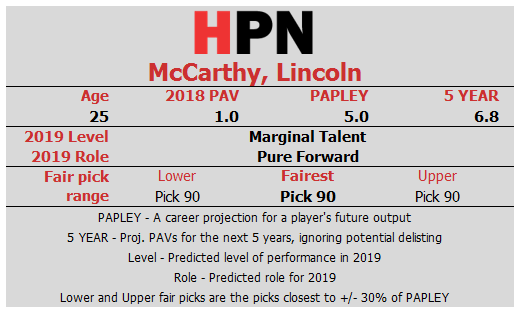 If this is the case, the value of McCarthy to the Lions is less his chances of contributing as a small forward and more about that other move. The fairest move would probably have been McCarthy moving as a delisted free agent, but the trade Geelong and Brisbane have struck is quite a reasonable one, amounting to a movement of about nine draft slots across the third round. 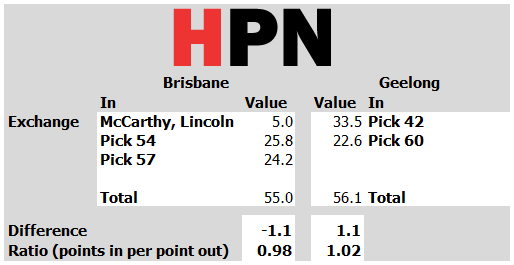 The upgrade in terms of pick value is minimal, especially given Geelong already had four picks in the 40-60 range, but it pretty accurately reflects the low expectations for McCarthy. McCarthy is the least valuable part of a swap of third round picks, and anything the Lions get out of him will be a pleasant bonus. This is the third flyer that Brisbane has taken in recent years on fringe Cats forward types – with the Lions trading a 2016 third rounder for Josh Walker and Jarrad Jansen in 2015. Jansen managed just 3.4 PAVs in his time at the Lions, while Walker is still going strong with 20.2 PAVs to date. In return, the Cats ended up with pick 43 (expected to return 32.8 PAVs), with which they nabbed Esava Ratugolea – who looks on track to outperform his slot. The Lions will be hoping that the third time will be the charm – but even if it isn’t, they didn’t give up much.